This picture, taken by John Crae and used with his kind permission, shows the Valiant Jetty leaving the Inchgreen Drydock on the first stage of its 12-mile journey to Faslane. The concrete jetty, named after the first British designed and built nuclear submarine, has been almost three years under construction in the drydock, and is 200 metres in length and weighs around 44,000 tonnes. Many of the ancillary structures on the jetty have been fabricated locally, much of the work having been carried out by nearby Ferguson Shipbuilders. 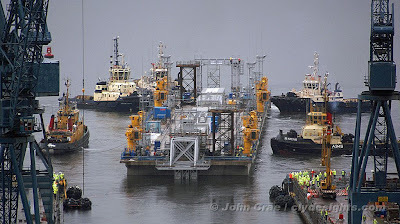 The jetty, costing around £150 million, was towed to Faslane in a six-hour long operation by five tugs, with SVITZER MALLAIG as lead tug. AYTON CROSS and SD DEXTEROUS were on the left side of the structure, and SVITZER MILFORD and SD IMPETUS on the right. The jetty will be used by the new 'Astute' class advanced attack submarines due for delivery over the next few years.